PAYEN DE NOYAN ET DE CHAVOY, PIERRE-JACQUES, officer in the colonial regular troops, seigneur, and king’s lieutenant at Trois-Rivières (Que. ); b. 3 Nov. 1695 in Montreal (Que. ), son of Pierre Payen* de Noyan and Catherine-Jeanne Le Moyne de Longueuil et de Châteauguay; d. 30 Dec. 1771 in Paris, France. Like his father, Pierre-Jacques Payen de Noyan entered the colonial regulars; he was promoted ensign in 1712, lieutenant in 1722, and captain in 1729. 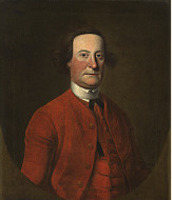 In 1721 he served briefly as commandant of Fort Frontenac (Kingston, Ont.). He made several trips to the pays d’en haut, including one in 1729 when he led the provisioning convoy from Montreal into Michilimackinac (Mackinaw City, Mich.) as preparation for the offensive against the Foxes [see Kiala*]. Some time before 1724 he inherited the fief of Chavoy, near Avranches, France; in that year Maurepas, minister of Marine, arranged for him a two – or three-year delay in rendering foi et hommage for the property. From 1730 to 1731 Noyan was in France, where he had been summoned to present a plan for dealing with the Foxes. His proposal was detailed and perhaps workable; along with suggestions about the conduct of military operations, he even included pattern speeches to be used before Fox leaders. The plan’s most interesting feature was that the campaign should be paid for by selling fur trade permits, to relieve the crown of any expense. In the event, Noyan’s scheme was not needed, for while he was in France the Foxes were defeated by Governor Beauharnois*. Nevertheless, Noyan impressed Maurepas, and from that time he was considered an authority on the west. In 1733 Noyan was scheduled to command at Michilimackinac, but illness kept him from that post. The following year he was assigned to Pointe-à-la-Chevelure (near Crown Point, N.Y.); because of recurring sickness, however, he was there only intermittently and during the summer he was replaced. 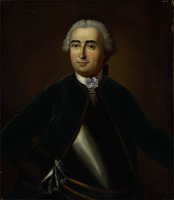 Beauharnois commented that “this officer is indeed subject to most extraordinary illness.” In 1738 Noyan was appointed to command at Detroit and, following an operation on his left breast, he set out for the post the next spring. Noyan remained at Detroit until mid 1742. There he had two serious problems, the excessive trade in brandy and an Ottawa-Huron feud. During most of his term of office he had a free hand in dealing with these problems, and he corresponded directly with Maurepas, an unusual situation on the frontier which was evidently a result of his good relations with the minister. But although he tried harder than most commandants to curtail the brandy trade, his powers were nevertheless limited and he did not succeed. To settle the Ottawa-Huron dispute, Noyan recommended that the less numerous Hurons be sent to locate near Montreal and that they be replaced by Shawnees from the Ohio valley. Opposition from the Huron missionary Armand de La Richardie* prevented the move, however. In spite of this disagreement, Noyan and the missionary remained good friends. 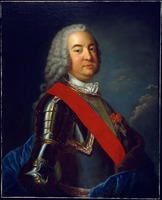 In May 1749 Noyan became major of Montreal and in March 1756 king’s lieutenant at Trois-Rivières. While still holding the latter position he was appointed to command again at Fort Frontenac. The post was a supply centre for the western garrisons, but it was in poor condition; Montcalm* referred to it as “good for nothing” and its complement of about 60 soldiers as a “feeble garrison.” When a force of nearly 3,000 British and American soldiers under Lieutenant-Colonel John Bradstreet laid siege to the fort in August 1758, it surrendered after three days. Bradstreet and Noyan worked out an arrangement in which Noyan was to be exchanged for Colonel Peter Schuyler*, and Noyan was permitted to return to Montreal because of his poor health. Vaudreuil blamed Noyan for the defeat, claiming that he was too old to fight. Stung by the governor’s lack of faith, Noyan requested retirement, which was granted with a pension in January 1759. After the surrender of Canada, Noyan went to France where he was imprisoned in the Bastille from March 1762 to December 1763 in connection with the affaire du Canada. He seems to have been guilty of no more than negligence in checking the inventory of Joseph-Michel Cadet’s goods at Frontenac, and he was fined only six livres. He died eight years later. On 17 Nov. 1731 at Montreal Noyan had married Louise-Catherine d’Ailleboust de Manthet, widow of Jean-Baptiste Charly* Saint-Ange, and the couple had two sons and three daughters, one of whom, Catherine-Angélique, married Pierre-Jean-Baptiste-François-Xavier Legardeur de Repentigny. In 1733 Noyan had been granted a seigneury on the Rivière Richelieu which became known as Noyan, and in 1740 one on the Ottawa River near that of the Séminaire de Québec. His wife sold the former seigneury to John Campbell and Gabriel Christie in 1764 and probably joined her husband in France. Pierre-Jacques Payen de Noyan et de Chavoy was one of the better colonial officers in New France. He served with distinction and in 1741 was awarded the cross of Saint-Louis. 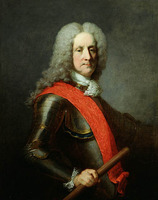 As major of Montreal, king’s lieutenant at Trois-Rivières, and commander of several western posts, he was effective, unselfish, and held in high respect by his superiors. Neither his defeat at Frontenac nor his implication in the affaire du Canada should affect this reputation. AN, Col., D2C, 58, p.23ff. ; 61, p.167; 222 (copies at PAC). “The French regime in Wisconsin – II,” ed. R. G. Thwaites, Wis., State Hist. Soc., Coll., XVII (1906), 73, 107–8, 170–72, 284–85, 326–27, 348–50. Michigan Pioneer Coll., XXXIV (1905), 113–15, 186–88, 340. NYCD (O’Callaghan and Fernow), X, 83–88, 499–518, 825–26, 831–32, 835–55. PAC Report, 1904, app.K, 173–74, 198, 252; 1905, I, pt.vi, 118–19, 223. DAB. Dictionnaire national des Canadiens français (1608–1760) (2v., Montréal, 1958), II, 1036. Æ. Fauteux, Les chevaliers de Saint-Louis, 140. Le Jeune, Dictionnaire, II, 363–64. Tanguay, Dictionnaire, VI, 265. Ægidius Fauteux, La famille d’Aillebout: étude généalogique et historique (Montréal, 1917), 128–31. “Les seigneuries de Noyan et de Foucault,” BRH, XXXVIII (1932), 399. Donald Chaput, “PAYEN DE NOYAN ET DE CHAVOY, PIERRE-JACQUES,” in Dictionary of Canadian Biography, vol. 4, University of Toronto/Université Laval, 2003–, accessed April 24, 2019, http://www.biographi.ca/en/bio/payen_de_noyan_et_de_chavoy_pierre_jacques_4E.html.